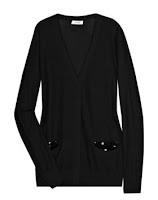 This jacket from La Redoute looks so butter soft, I just need to touch it. And it's got a lovely, Rick Owens-esque shape to it. 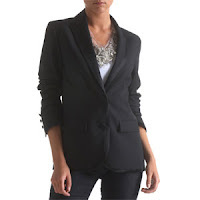 I'm also on the lookout for a good black blazer, and this one by Michel Kein at La Redoute looks like it will fit the bill. 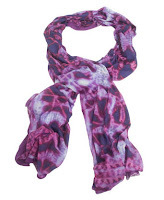 I saw these phoenix scarves at Liberty over Christmas, and have been thinking about them ever since. They sell them on the website, so Glaswegians need not go without. I've been considering the merits of reusable water bottles of late, and after a bit of searching, I've decided that this sleek metal version from Millican will service my needs. Though I'm very excited about the notion of mid heels coming into fashion this summer (those super high heels did nothing for me, as I have totally flat feet and I'm 6 feet tall), I'll continue to invest in ballet flats. I love the idea of having them in every colour and pattern. My favourites are from French Sole, as they have a mind boggling selection, they are really comfortable, and they can accommodate my big feet (we're talking Sideshow Bob here). Surely Spring is just around the corner (as any fashion magazine will tell you) so spring cleaning is on my weekend agendas. To give me the necessary energy to whirl around my flat with hoover and duster, I'll need to replace our broken record player. Turntables are relatively hard to find in Glasgow, unless you want to buy the USB variety, or you're a dj and are willing to spend a fortune. But the reliable folk at Richer Sounds (on Jamaica Street, past the Currys and Matalan) offer a range of price points on turntables and amplifiers, so it's just a matter of figuring out how much we're willing to spend, and what features, other than a dust cover, we're actually looking for. And, now that it's starting to get lighter in the mornings, can daily drizzle be that far behind? I'm getting ready with this parka, which comes in a rainbow of colours from Uniqlo.